Quietly dry humor marks this story about a most unusual pet. An unassuming girl looks straight out at readers and explains her desire for a pet. She’s not fussy, but she can’t make it happen: “My mother said no to the bird. / No to the bunny. / No, no, no to the trained seal.” Finally her mother consents—sort of: She agrees to any pet “as long as it doesn’t need to be walked or bathed or fed.” After some library research, “[m]y sloth arrived by Express Mail.” Here it gets really funny. 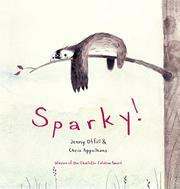 The girl waits two days, standing in moonlight and rain next to Sparky’s backyard tree, before he even awakens. She teaches him games: “We played King of the Mountain / and I won. // We played Hide-and-Seek / and I won.” Sparky never moves a muscle. Sitting on the grass, he’s stock-still; on his tree branch, he lies motionless (atop the branch, inexplicably but adorably, not hanging down in sloth fashion). Even his expression’s comically immobile. Training sessions and a performance proceed—um—at Sparky’s pace, but a beautiful closing illustration of girl and sloth together on his branch shows how close they’ve grown. Appelhans uses blue and pinky-brown watercolors and pencil on creamy background to create understated humor and affection with a light touch.